These are dark days. I was in London when the results of the referendum came out. I was still reeling with shock and dismay that afternoon when I went to the Sunken Cities: Egypt’s Lost Worlds exhibition at the British Museum. For an hour and a half I lost myself in this wonderful exhibition. 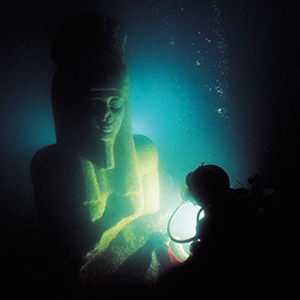 The lost cities of Thonis-Heracleion and Canopus lay at the mouth of the Nile and were buried under the sea for over a thousand years. Underwater excavation has been taking place over the last twenty years. Objects in the exhibition range from colossal statues to intricate gold jewellery. I was moved by the serenity and beauty of some of the figures which, like the one in foreground of this photo, fused Greek and Egyptian styles. I was fascinated by the sacred offerings and ritual objects related to the cult of Osiris – the god of the underworld. I came out feeling that I had escaped for a while and visited one of the great civilisations of the past. And I remembered that all things pass after all. On the way home I stopped off at Hatchard’s and treated myself to another form of escapism. 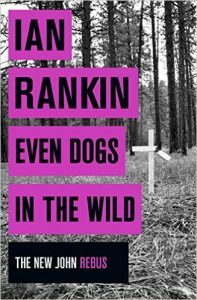 I bought Even Dogs in the Wild by Ian Rankin and spent the journey back to Chesterfield in the company of an old friend, John Rebus. There’s not much that can’t be made better by a good book or the consolation of art. Oh gosh I know what you mean, in all directions. These are troubled times we live in. Apart from the result, I hate that feeling of divisiveness, that two sides are staring at each other in mutual incomprehension. But yes, art in all its forms can help. I went to the opera on Sunday, Verdi’s Don Carlos, a work of great sweeping power and quite miserable! Politics and religion and love all going wrong. Made 2016 UK look a bit better, and the wrenching feelings were cathartic. Thanks, Moira. Do envy you the trip to Don Carlos. I do love opera. I wish we were nearer London. However we’re going to a couple of things at the Buxton Festival which will be good. It does all seem like a bad dream – and continuing events! Yes, very sad that so many people clearly feel so hopeless and left behind that any change to the status quo seems worth trying – even just as a protest.